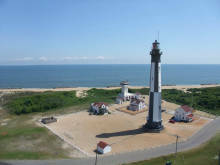 Cape May is characterized by the iconic Cape May Lighthouse, the Cape May Zoo, old Victorian mansions, family beaches, jazz festivals, and birdwatching opportunities. The local economy is supported by quaint B&B’s, historic hotels, restaurants, as well as other commercial businesses and fishing. Diamond Beach is an exquisite neighborhood distinguished by its famous “Sunset Beach,” however the average rental property comes with a high price tag due to its close proximity to Sunset Beach, where you can view spectacular sunsets year-round. The Diamond Beach neighborhood is home to married couples, with and without children, however, it is not a popular place of residence for singles. West Cape May is another excellent choice for a neighborhood, because it is very quiet during the year, as seasonal property owners leave; it also features a diverse community with regards to ethnicity as well as socioeconomic class. Although Cape May is home to beach lovers, retirees, and married couples, the average housing cost is significant higher than the national average due to its beloved scenery. Click the tabs to learn more about what it's like to retire in Cape May! Match me with 3 top Cape May Realtors!